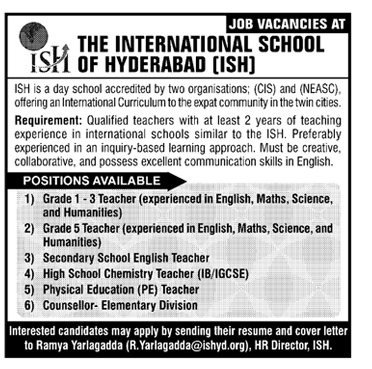 The International School of Hyderabad has advertised for recruitment of Teachers jobs vacancies. Interested and eligible job aspirants are requested to apply as soon as possible from 22nd November 2018. Check out further more details below. About School: The International School of Hyderabad is a non-profit, English medium international school located in Hyderabad, capital city of Telangana, India. The school serves students from overseas and Indian students who plan to do their post-primary education overseas. How to Apply: Interested candidates are requested to send CV with covering letter along with copies of certificates and recent PP size photo to the email address provided below.